Question Builder is designed to help elementary aged children learn to answer abstract questions and create responses based on inference. Extensive use of audio clips promotes improved auditory processing for special needs children with autism spectrum disorders or sensory processing disorders. Audio clip reinforcement can be turned on or off for non-special needs children. Question Builder offers a rich and fun environment for improving the ability to abstract. FEATURES -Simple and intuitive interface to answer questions -Why, What, Where, How and Random question formats -1200 audio clips of questions and answers -3 levels of abstraction -Optional text and audio reinforcement -Statistics to track student progress -60 encouragement animations and audio clips LANGUAGES - English REQUIREMENTS - Compatible with Iphone or Ipod Touch - Requires Iphone 4.1 software update Question Builder features SmarTots, the premier mobile education application network for families. SmarTots provides learning reports and mobile education app reviews that help parents understand what their children are learning. Signing up for SmarTots also gives parents access to fun activities that enhance the educational value of mobile education apps like this one. Click the Parent Button inside this app to get these great features. Mobile Education Tools is a member of Moms with Apps, a collaborative group of family-friendly developers seeking to promote quality apps for kids and families. 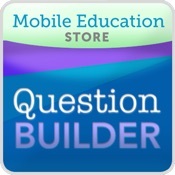 Question Builder is a free educational mobile app By Mobile Education Store LLC.It helps students in grades 3,4,5 practice the following standards . This page not only allows students and teachers download Question Builder but also find engaging Sample Questions, Videos, Pins, Worksheets, Books related to the following topics.